Kobe. Laid down at Kawasaki Dockyard Co. Ltd. as a 5,873-ton cargo ship for Kawasaki Kisen K. K.
In Kawasaki Kisen's service including its Japan ~ Europe route via the Suez Canal. Kawasaki Kisen joins together with Kawasaki Zosen and Kokusai Kisen to form "K" Line”. A winch is installed on INDIA MARU for use in a salvage operation of the Imperial Navy's first submarine. INDIA MARU arrives at Ellis Island from Denia, Spain. In service on “K” Line's Port of Yokohama ~ Africa route. Requisitioned by the Imperial Army (IJA) and converted to a troop transport. Alloted IJA No. 390. At 0830, INDIA MARU departs Camhranh Bay in TransDiv 6 also consisting of ARABIA, MEXICO, RISSHUN and THAMES MARUs carrying the IJA "Dami Detachment". At 1600, arrives at Kota Bharu, Malaya and begins landing troops. 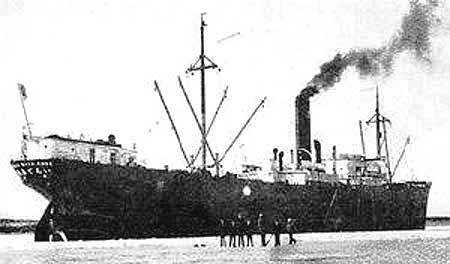 INDIA MARU departs Borneo carrying LtCol Watanabe, commander, 3rd Battalion. Arrives at Lingayen Gulf, Philippine Islands. INDIA MARU departs Lingayen for Cebu, Philippines in an invasion convoy with BORNEO, MEXICO, NAGANO, RISSHUN, RYUUN, TAIRYU and TOTTORI MARUs escorted by light cruiser KUMA, DesDiv2 (less 2 destroyers) HARUSAME, MURASAME, SAMIDARE and YUDACHI , torpedo boat KIJI, gun boat BUSHO MARU and auxiliary subchasers KIYO MARU No. 12 and KIYO MARU No. 13. The convoy carries 4,852 men of the Kawaguchi Detachment's consisting of the 35th Infantry Brigade HQ, 124th Infantry Regiment, 1 platoon of the 16th Reconnaissance Regiment, 4th Company, 22nd Field Artillery Regiment, 2nd Company, 21st Field Heavy Artillery Battalion, the main force of the 44th Anchorage HQ, 1 platoon of the 23rd Independent Engineer Regiment [type “E”], 1 company (less 2 platoons) of the 26th Independent Engineer Regiment [type “D”] and part of the Logistics Units. The convoy arrives at Cebu. INDIA, MEXICO, RISSHUN TAIRYU and TOTTORI MARU begin to land troops at Cebu City and on the west coast (Argao) (Aloguinsan and Barili) with 4 Daihatsus, 3 Shohatsu landing craft. The transports land the 3rd Battalion, 124th Infantry Regiment, Regimental Gun Company, 1 platoon of Rapid-fire Gun Company, part of Regiment Signal Unit, a temporarily formed Armored Car Company, 2 platoons of the brigade signal unit, part of the 14th Army Radio Platoon and part of the 67th Line-of-communications Hospital. Seaplane tender SANUKI MARU covers the landings. Meanwhile, BORNEO and NAGANO MARUs land toops on the east coast (Argao) of Cebu Island. with unknown landing craft. The two transports land the 124th Infantry Regiment HQ, 1st Battalion, the 124th Infantry Regiment, 2nd Battalion (minus 7th Co), the 124th Infantry Regiment, Rapid-fire Gun Company (lessus 1 platoon), the main force of Regiment Signal Unit, 1 platoon of the brigade radio signal unit, 1 armored car platoon of the 16th Reconnaissance Regiment, 4th Company, the 22nd Field Artillery Regiment, 1 platoon of the 14th Army Road Construction Unit, part of the 14th Army Propaganda Section, 2nd Company, 21st Field Heavy Artillery Battalion and a temporarily formed anti-air machine cannon unit. Ten 3rd Bomb Group B-25-C “Mitchell” medium bombers fitted with long distance tanks and three B-17 “Flying Fortress” heavy bombers of the 19th Bomb Group, all under the command of BrigGen (later MajGen) Ralph G. Royce, take off from Charters Towers Airfield, Townsville, Queensland, Australia via Darwin for the 1,500-mile flight to Del Monte, Mindanao. All the planes arrive safely at Del Monte where the tanks are removed and replaced by bombs. The B-25s are then dispersed to concealed P-40 “Warhawk” fighter airstrips at Valencia and Maramag. SANUKI MARU launches four F1M2s “Pete” float fighters to bomb the USAAF airfield at Del Monte. A P-35A "Guardsman", orbiting the air field, engages the Petes, while two P-40Es take off to intercept them. An F1M2 is shot down by one of the P-40s, but the other three F1M2s bomb the airfield. They wreck a B-17E and damage two others. At 1815, SANUKI MARU enters Cebu Port. Just after midnight, ten B-25s take off and bomb shipping at Cebu Island. Royce’s B-25s fly more than 20 sorties against shipping and harbor facilities at Cebu. Two of the B-17's carry out single-bomber strikes from Mindanao against Cebu harbor. Released by the IJA back to her owners. INDIA MARU departs Saeki in Military Movement No. 8’s convoy "M" consisting of GISHO, SUMIDA, TENRYU and TOKIHIME MARUs and HAKUTETSU MARU No. 13 escorted by minelayer YURIJIMA and auxiliary minesweeper TAMA MARU No. 7. The escorts are detached at 29N. The convoy arrives at Saipan. At 0730, INDIA MARU departs Rabaul in a convoy also consisting of BRAZIL, CHIFUKU, CLYDE, DELAGOA, FUKOKU, FUKUYO and UCHIDE MARUs escorted by minesweepers W-17 and W-21. At 0900, LtCdr (Cdr/MOH, posthumously) Howard W. Gilmore's (USNA ’26) USS GROWLER (SS-215) torpedoes and sinks CHIFUKU MARU at 04-03N, 151-55E. One crewman is KIA. At 1630, INDIA MARU departs Palau for Hansa Bay (near Madang), Eastern New Guinea and Wewak, New Guinea in the “Hansa No. 2B” convoy also consisting of SYDNEY, TAISEI, TAIYU, TEIRYU (ex-German AUGSBURG) and TOHO MARUs escorted by destroyers AMATSUKAZE and TANIKAZE and subchasers CH-26 and CH-34. The convoy is carrying units of the IJA 20th Division including the 48th Field Road Construction Unit. E of Nubia, Hansa Bay. At 1530, 20 USAAF 5th Air Force B-17s and Consolidated B-24 "Liberator" heavy bombers set SYDNEY MARU afire while she is unloading at 03-18S, 143-38E. At 1535, she is beached and abandoned. Three soldiers and nine crewmen are KIA. At 0900, departs Hansa Bay for Palau. At 0700, TEIRYU and TOHO MARUs escorted by destroyer AMATSUKAZE and subchaser CH-34 are detached for Palau. The remaining ships steam to Wewak where they discharge their remaining cargoes that evening. Near Kairiru Island. USAAF 5th Air Force Boeing B-17 "Flying Fortress" heavy bombers sink INDIA MARU at 03-21S, 143-43E while she is leaving for Palau. Three gunners and seven crewmen are KIA. Thanks go to Erich Muetlthaler of Germany and Fontessa-san of Japan.